A new program offered through the Graduate School of Education at the University of California, Riverside, seeks to boost the number of fully credentialed special education teachers in Southern California’s Inland Empire. Students accepted into the 2019 cohort of the UCR Special Education Scholars Program can earn both their master’s degrees in special education and their state-mandated education specialist instruction credentials — all without incurring debt. To qualify for one of 15 “service awards” that cover costs of the program, each applicant must commit to working for at least four years as a special education teacher in either a Riverside or San Bernardino county school district upon graduating. The goal is to address the extreme shortage of fully credentialed special education teachers in the Inland Empire by funding cohorts of students who want to serve in these positions in Riverside and San Bernardino county schools, said Thomas Smith, dean of UCR’s Graduate School of Education. In neighboring Riverside and San Bernardino counties, more than 100,000 of the region’s 843,000-plus students are identified as special education students, with the majority coming from low-income families. Data released by the state indicates most of California’s special education students have been diagnosed with learning disabilities, speech or language impairments, or autism spectrum disorder. To keep up with the growing demand, the Riverside County Office of Education joined forces in 2018 with the San Bernardino County Superintendent of Schools to apply for one of 41 Local Solutions Grants offered to address the shortage of special education teachers across the state. Awarded by California’s Commission on Teacher Credentialing, the grants make use of $50 million from the 2018-19 state budget to finance “the recruitment, preparation, and support of new special education teachers” for up to five years. By partnering with UCR to administer the funding they received from the commission, the two county offices hope to ensure newly trained special education teachers enter the field with the kind of preparation and ongoing guidance that will ensure their success. Providing financial support in the form of service awards is sure to be a “game-changer for many would-be teachers,” said Beth Higbee, assistant superintendent for the San Bernardino County Superintendent of Schools. “This is especially true in our region, where many candidates seeking a master’s degree in education may be the first in their families to go to college, let alone receive post-degree training in a specialized area,” Higbee said. In San Bernardino County alone, she added, 4,681 teachers are projected to retire by 2024, making this a critical time to encourage new educators to join the region’s teaching force. 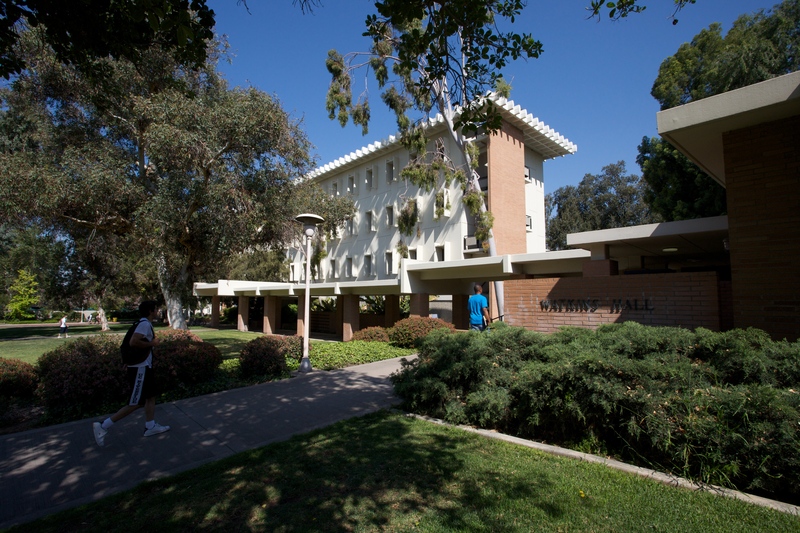 The Graduate School of Education is based in Sproul Hall, pictured here. UCR will accept as many as 15 students to begin the Scholars Program in fall 2019, with the master’s degree and credential typically taking five quarters to complete. Each student will receive a total of $25,000 in awards, $20,000 of which comes out of the Local Solutions funding and must be “earned” through four subsequent years of service. An additional $5,000 per student will be awarded by UCR as a no-strings-attached scholarship to cover other tuition costs and fees. Along with the funding, each accepted student will be guaranteed an interview with a school district in Riverside County and/or San Bernardino County upon earning the master’s degree and credential. Candidates can indicate preferred counties during the application process, with 10 positions available in San Bernardino County and five in Riverside County. In order to fully “earn” their $20,000 service awards, students must be hired by one of the two counties’ districts and work for four years as special education teachers in those districts. If the requirements aren’t met, students will be expected to repay their $20,000 service awards as loans. Smith said the scholars would also benefit from mentoring and professional development opportunities geared toward helping new special education teachers acclimate to the field. Barbara Howard, executive director of the Riverside County Office of Education’s Center for Teacher Innovation, said the county plans to offer “an extra layer of support” through professional development workshops that tackle topics teachers don’t necessarily master during their training. The final deadline to apply for the Special Education Scholars Program is March 22, 2019.